The Zogoflex Jive is the most durable dog ball yet. Jive is the only dog ball toy you need - bright, bouncy and BPA-free. 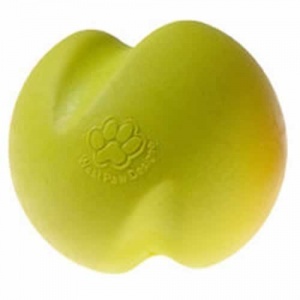 This large tough dog ball is 8cm wide. Jive is made from the extremely tough Zogoflex material and is so strong that it is guaranteed to stand up against dog destruction. If your dog can damage this dog toy ball we will give you a one-time free replacement or refund. 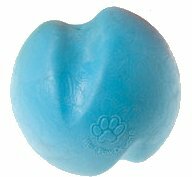 Other dog chew toys can be hard on dogs' teeth, but even though Jive is guaranteed strong this ball also bounces, floats and is gentle on dogs' mouths. Jive is recyclable and dishwasher safe. A Dog Toy that lats! Our Golden Doodle destroys every toy that we've bought - until this one! So far only a few cosmetic scuff marks. So good I've bought one for my friend's boxer. Great toy for dogs who love to chew. Has an unpredictable bounce which my dog seems to enjoy. It is quite heavy but my dog is a large breed so is happy throwing/rolling this around. The grooves also make it easy for her to carry. This brand is worth it for dogs who make easy work of other chew toys.